It has been scientifically proven that clutter causes stress. Everyone is so busy these days. Work and kids’ activities really take us away from our homes so much of the time. PTA meetings, taxi service for the kids, and church meetings can really distract from keeping our houses as we want to. When we do finally have a little time for ourselves, the last thing we want to do is clean things up. Does that give us permission to have a messy home? It is important to realize that the busy times with our kids is a season in our lives. They won’t be little forever and we do need to take time to be with them. They are our most important work. For me, being busy has always been an excuse to not take care of things at home. Afterall, not being home is a legitimate reason. I rarely made homemade meals, instead opting for fast food on a regular basis. I also piled belongings higher and higher into closets and purchased lots of storage containers to hide my clutter. With four kids and six different busy schedules, things quickly got out of control. The chaos affected my health and things just had to change. You can read about my real food journey here, here, and here. Today, I want to focus not so much on the real food as the real life that I live. I really feel like when I maintain an orderly home that there is more time to prepare homemade real food meals for my family. This is the cornerstone that I build my Juggling Real Food and Real Life philosophy around. I found that choosing a target was the best place for me to start. Look around your home and decide what overwhelms you the most. What frustrates you the most often? What area of your home really drives you bonkers and slows you down on a regular basis? Is it your jam-packed closet? Maybe it’s having all of your storage containers fall on your head as you are trying to grab cereal bowls for the kids in the morning? Perhaps, it is the huge piles of paper on the floor of your office? Pick the area that frustrates you the most and start there. Keep your focus on that area until you completely declutter it. Don’t buy any containers. What? That’s no fun. True. I do love brightly colored storage containers. However, you are not ready to organize yet. My favorite decluttering saying is, “You can’t organize clutter.” Once you have completely decluttered an area, you will be able to organize it……….but not until you have decluttered. Have I said that enough times yet? Go through the target area and only keep the things that you really love and fit in with your current lifestyle. Be realistic. That means sitting yourself down sometimes and having a real heart to heart. If your current definition of entertaining is having toddlers over to play, you probably don’t need an elaborate collection of wine glasses and barware. Keep a few for yourself, and then donate the rest. You probably don’t need twenty-two sets of sheets for each bed. Purge your collection to a reasonable number. You will be surprised to find out that you actually do have plenty of room in the linen closet if you get rid of all of the extras. Don’t feel pressured to keep items because it was given to you as a gift. Only keep the things that you love, will use, and have room for. There you go…..set your target and get started. You will feel so much more organized when you have cleared one table, closet, or area of your home that really drives you crazy. A little less stress in our lives certainly will do us all a lot of good! What area of the home drives you the most crazy? What area of your home have you set as a target? What advice do you have to offer someone who is just starting on their decluttering strategy? Want more decluttering advice? Check out the Freedom From Clutter in 40 Days series by clicking the image below. 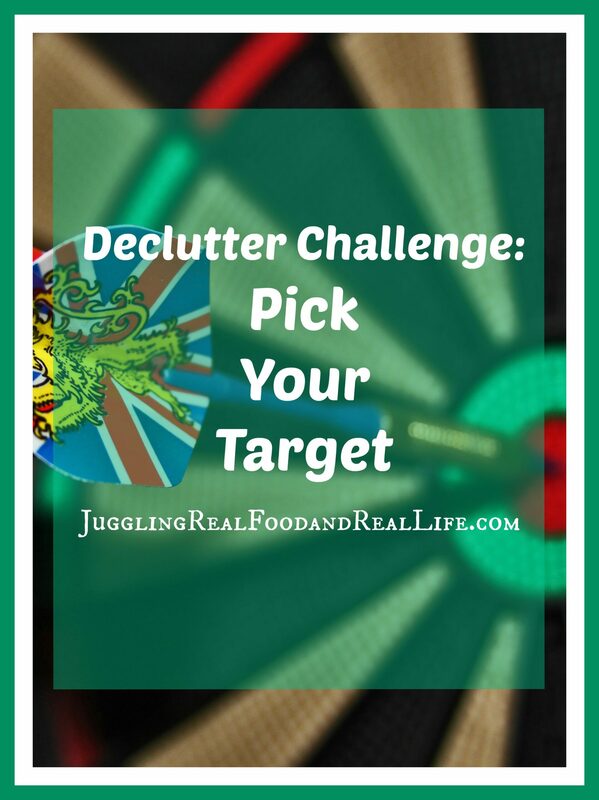 You could turn the clutter series into an ebook…..